Last Saturday I did an article on the new British Airways promotion for The Economist. 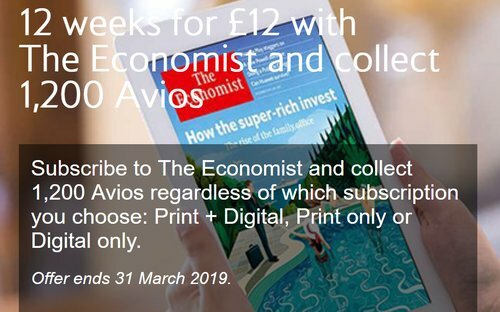 It implies that you were getting 1,200 Avios for taking out a 12-week £12 trial subcription to The Economist. Given that British Airways ran such an offer in 2018, albeit with a slightly smaller bonus of 1,050 Avios, I wasn’t surprised to see this deal. This was a total cost of £100 for which you will receive just 1,200 Avios. This was a terrible incentive, especially compared to normal Economist offers for buying a full year subscription. In my article last Saturday I said that I thought there may have been an error, although it did say clearly in two places that you needed to remain a subscriber for 26 weeks. This is still a bad deal compared to the usual Economist subscription deals. You are spending £56 to get back 1,200 Avios which remains a poor incentive. This offer is for new subscribers only and to be eligible for this offer, subscribers must be a member of British Airways Executive Club Programme. 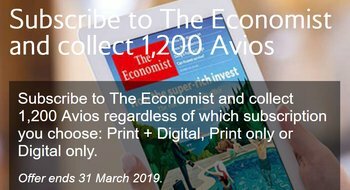 Eligible members will collect 1,200 Avios for a Print, Digital OR Print AND Digital subscription. This Avios offer from 1 February 2019 until 31 March 2019 will only be available in the UK. To sign up, Eligible Customers must visit the dedicated webpage and click on ‘Subscribe now’, choose the subscription type (digital and/or print) and enter the 8-digit, British Airways Executive Club membership account number. Avios will be awarded to your account within 28 days. After 12 weeks, pay £53 per quarter thereafter for the Print & Digital option or £44 per quarter thereafter for the Print or Digital options. In order to qualify for the Avios in this offer, the Eligible Customer must maintain a subscription for at least two quarters (25 weeks). This subscription is non-refundable, except if the customer is a resident in the EU, in which case the customer may cancel the subscription in the first 14 days and get a refund for any part of your subscription that has not already been delivered (for the print element) or published (for any digital element) before it is cancelled. Avios are issued and redeemed in accordance with Avios Terms and Conditions. If you are looking to take out an Economist subscription I would wait until this offer is replaced in April or look for a deal with another partner which is more attractive. Also I’ll allow you the new Virgin Tel Aviv route as it seems like the just kind of helpful piece of information I would expect from a TripRep. Its only the constant posts about how to best churn someone’s next Amex card application that really wind me up. By the way where is Genghis? I don’t seem to have seen a post from him here in ages……. The way to churn Amex cards is clearly set out in their Terms and Conditions. I’m around. Been lurking more recently. I’m only really interested in discussions of good offers, travel destinations etc. There’s not been much recently. Meaningless chatter (like this post itself, but in response to you) don’t really appeal. Still love to know what software you use that lets you know when your name is mentioned here within about five minutes of the person doing so making their post about you……. I know the software but I’ll wait for a post on the subject before commenting further, to avoid more OT’s. A quick OT. Where’s the best place to post OT’s? OT: What’s the best way to churn my next Amex card application? Do people wait exactly 6 months or a while longer just to be safe? I wait a bit longer personally but I wondered whether holding a blue BA amex stops me getting the Virgin Atlantic sign-up bonus. I also collect Tesco CC points if that is relevance but don’t have a Centurion card. I did wonder but then it was believable based on some comments! O/T @Julean What was your objection to the OT posts? I can’t remember. Obviously that its far more useful for the comments on a specific topic related article by Rob or his staff to only relate to that particular article. I have no problem with people wanting to discuss other issues each day but Rob should provide a place for them that doesn’t obstruct and pollute meaningful discussion below his own topic related articles,. I am completely opposed to Rob’s encouragement of people constantly churning Amex cards because the scale of it that this site encourages is obviously unsustainable and will sooner or later lead to the practice being banned just as happened with Rob and others constantly mentioning individual products in Tesco stores offering disproportionate numbers of Tesco Clubcard points did. There are no articles on churning on here Julian. You must be thinking of other sites. @Julian If churning is banned surely you will be pleased? Churning has already been outlawed in the US. There’s been talk of it here, Rob’s encouragement is just ensuring the process gets pushed through at the earliest opportunity. Hopefully I can get a few last churns in before the hammer comes down. One of the issues of you remove OT posts / move them elsewhere is that each article will receive far fewer comments. This would presumably have a negative impact on HfPs advertising space, as perceived engagement would fall. Correct. You can fake anythjng these days – page views etc – but you can’t (easily) fake 300 comments per day. This drivel is now getting ridiculous. I agree. This drivel about churning needs to stop. I think Julian is being a little OTT here, but agree with his sentiment. Much better to have a forum where questions about churning can go, and free up the threads for more on topic comments. Dan, I don’t think what your suggesting is tenable given HFP’s cohort. there should be a button to mark a comment as “off topic” and then a choice on the website whether you want to see all posts or just the ON TOPIC ones. The scroll wheel on my mouse gets too much use scrolling past the “OT no bits today” type of comment. The OT “issue” could very easily be resolved if there was always “Bits:” in front of one of the three daily articles and then there was a gentle nudge to post OTs there. There’s no real housekeeping as far as the comments are concerned. As for the point on churning – you can’t stop people talking about churning so you’ll just have to live with it Julian. There are no articles on churning as such but it really does make up a lot of the comments, it’s rather the point of the site. This is such a poor offer it makes you wonder why they’ve even bothered with it. Because it’s meant to prod anyone thinking about signing up who haven’t, not be a way to buy Avios! And now British Airways / Economist promoters have even confirmed their sneaky sneaky sneakily presented promotion was intentional ! they’ve just made a minor change to it, and left the sneaky bit pretty much in place. What a pity. I did a brief stint with the ASA and pretty sure avoiding reasonable complaints that could have been made to the ASA, was the reason they made the small change. But left the substance in place, as it was, as deceptively (apparently) as they still could. I imagine by using a site that cannot be named as he mentions “avios equivalent”. As I only value avios at 0.5p each I wouldn’t bite at that but as always value is in eye of the beholder. I would be wary of paying much more than 0.66p but I am averaging 1.15p over the last 7m redeemed. This is where you pay with Avios but reduce it with cash in effect buying the Avios? Is there a point at which you’d think I have enough Avios I’d sooner burn them than part with cash? Presumably anyone who have 5,000,000 Avios or more and who constantly picks up more on long haul BA flights paid for by their business is very keen to burn them at every possible opportunity before the next big BA devaluation makes them have even less value. Its easy to get 4p to 5p per Avios or more if you book last minute on European routes where BA jacks up the cash fares in Economy and Club to totally extortionate levels in the last 24 hours or so before departure. As to whether you would have ever bought those fares with cash at the very last minute is another matter but basically some people do so BA is in the business of ripping off people who miss their flights (which it is now much easier to do with BA since they now close their flights knowing several passengers have still not arrived at the gate on a similar ruthless basis to Ryanair), who are bereaved or who need to travel urgently at the last minute on business. Last minute BA ticket costs short haul are often 2 to 3 times the level charged by Easyjet or Ryanair on the same route. Julian – if you’re going to throw childish hissy fits about people talking about off topic things, STOP TALKING ABOUT OFF TOPIC THINGS. I asked for a status match from BA Silver and it was granted.